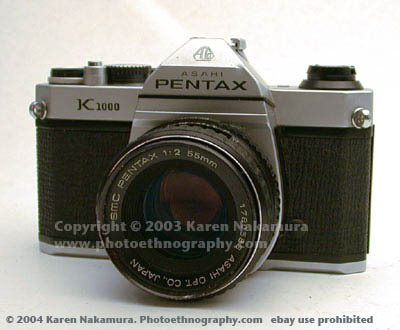 The Pentax K1000 was released in 1976 by the Asahi Optical Company. The last model with that marquee rolled down the assembly line in 1997, an amazing 21-year production span. Of course, there were changes during that time, most notably a change from Made-in-Japan to Made-in-China. Using the text or images on this website without permission on an ebay auction or any other site is a violation of federal law and your ebay terms of service. Unlike the previous M42 screw-mount Spotmatics, the K1000 used Asahi's new 'K' bayonet lens mount and was intended for advanced amateur photographers. 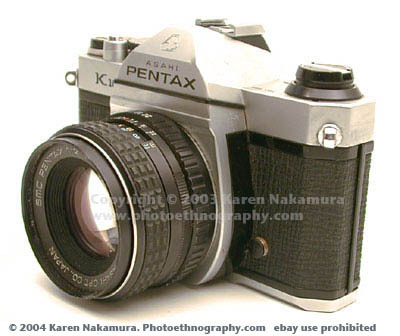 Unlike the Pentax ME which came out at the same time and had aperture-priority metering, the K1000 was all-manual only, with a built-in coupled match-needle meter very similar to the Pentax Spotmatic series. 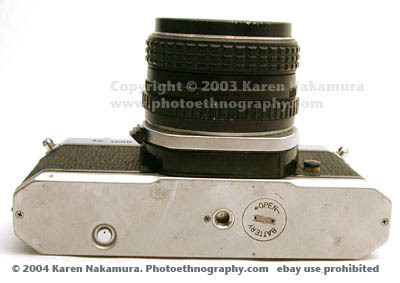 From the outside, especially the top-plate, the K1000 is a spitting image of a Spotmatic II. However, the K-mount added two new features: fast bayonet mounting and and that was full-aperture metering*. You no longer had to stop down to meter - in fact the stop-down lever was removed, which means there's no way to check for depth-of-field (DOF) with the original K1000. * That's not quite accurate. 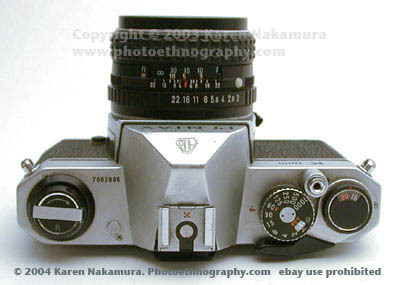 The Pentax Spotmatic SP-F had full-aperture metering, courtesy of a little aperture coupling knob on the lens. Unfortunately, the various M42 manufacturers each had their own full-aperture system which were not mutually compatible with each other. Using the text or images on this website without permission on an ebay auction or any other site is a violation of federal law and your ebay Terms of Service. Even now, 25 years later, the K1000 remains an excellent camera for student photographers. It's very tough, clad in a chrome metal body (except for the most recent versions). K-mount lenses are inexpensive and retain full compatibility with even the most recent Pentax bodies (unlike the Nikon system*, you can use the oldest K body with the newest K lens with almost no exceptions). So if you ever decide to go auto-focus, auto-everything (just say no!) 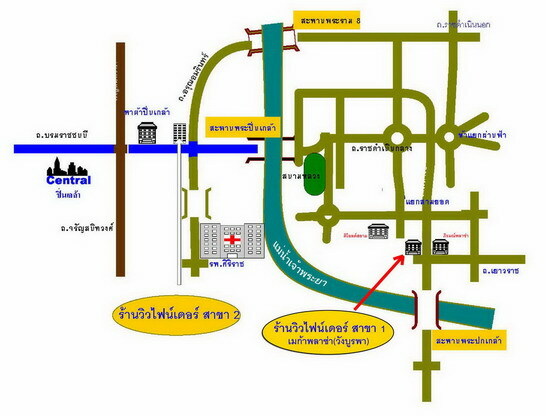 you can retain your excellent optical quality K-lenses as you migrate up. Using the text or images on this website without permission on an ebay auction or any other site is a violation of federal law. * The famed "backwards compatible" Nikon SLR system has enough incompatibilities and "buts" to fill an entire wall chart. The "Chinese" K1000 - The production line shifted to China during the K1000's 21-year span. Chinon was the factory owner. They made some changes to make the K1000 less-expensive to produce - most notably the top and bottom plate were made of plastic rather than of stamped alloy. This made the camera cheaper and lighter, but more fragile and cheap feeling. 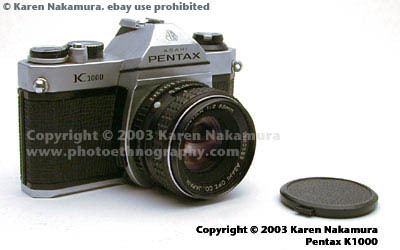 The Pentax K1000 you see here was made in Japan and if you have the choice, go with the earlier models because they are more durable. The Chinese and the latest Hong Kong production have chromed plastic top cover and bottom plate, but that does NOT affect durability by itself. Under moderate impact, plastic may actually hold up better than chromed brass, since it won't dent; it takes more to crack a plastic housing than to bend a brass one. 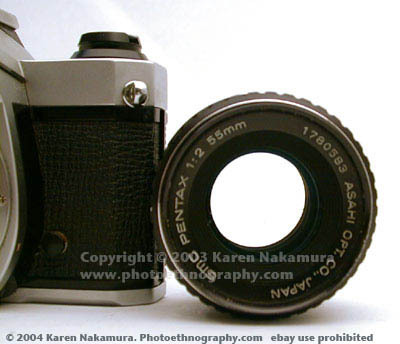 The plastic top cover is easily identified by its lack of the "Asahi" name above "PENTAX." However, internally there IS a substantial difference under moderate to heavy use. The Chinese version has a plastic rewind knob and shaft which can break under heavy use. The Chinese version and the latest Hong Kong production have a pot metal wind lever base which can bend, rather than a machined part. The symptom is a wind lever which scrapes the top cover. The Japanese and most Hong Kong production K1000 are similar in materials, construction and durability to the Spotmatics and the KX/KM. 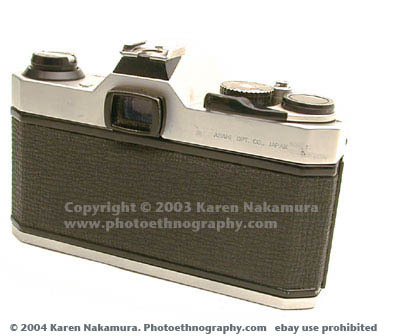 Surprisingly, the Chinese clones produced under various names (Mingka K1000 seems to be one, but there are several) use the older Japanese type parts, as it appears the old Spotmatic tooling was sold to the Chinese intoto. 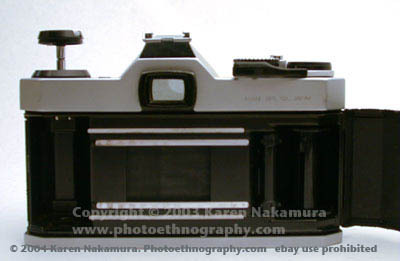 These even have the older type shims to set flange depth, instead of the threaded inserts in the similar Pentax bodies from the Spotmatic F and ES and newer. But Chinese quality control can be dismal. I bought a brand new Mingka K1000 in China (price, equivalent of about $45 USD) and within ten releases of the shutter after I got back to Hong Kong, the shutter failed. When I got home to the USA I tore it down and found one of the fabric shutter tapes for the opening curtain had detached from its roller. The other one was about to fail, too. The Chinese had not cleaned the rollers before cementing the tapes; they had tried to cement them to a film of oil. 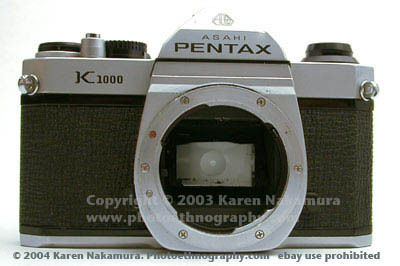 NOTE that I have NOT seen this kind of sloppiness on the Chinese-built Pentax K1000, presumably because Asahi Optical's own people were overseeing production. Workmanship was good on the Chinese Pentax K1000, the materials were where the skimping took place. 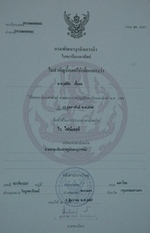 The Pentax K1000 manual is downloadable as a PDF file from Pentax's website. Note: Using the text or images on this site in an ebay auction without permission is a violation of your ebay Terms of Service. I will report you to ebay if I discover such a violation taking place. 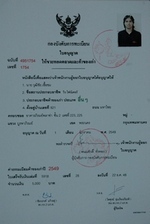 YOUR ACCOUNT MAY BE CANCELLED IF YOU USE UNAUTHORIZED IMAGES OR TEXT.